Robotic system may have potential advantages to facilitate the technically challenging splenic hilar lymphadenectomy during gastrectomy for gastric cancer. However, robotic spleen-preserving splenic hilar lymphadenectomy is performed infrequently not only because of the limited availability of the robot but also because of its technical difficulty. 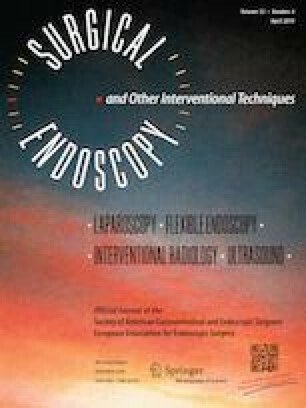 In this study, we describe our technique of performing robotic spleen-preserving splenic hilar lymphadenectomy in detail to facilitate wider application and present operative outcomes and the follow-up results of the procedure. From 2005 to 2015, 93 patients underwent robotic total gastrectomy with D2 lymphadenectomy. One patient with obvious lymph node (LN) metastasis received splenectomy and was excluded from the analysis. Intraoperative complications, operation and console time, estimated blood loss, postoperative morbidity and mortality, the number of harvested LNs in total and at the splenic hilum, and 5-year overall survival were analyzed, retrospectively. Among the 92 patients, robotic spleen-preserving splenic hilar lymphadenectomy was successfully performed in 91 patients except one who experienced intraoperative splenic artery injury which demanded splenectomy to be performed simultaneously. The overall mean operation time and console time were 287.2 ± 66.0 and 180.2 ± 47.2 min, respectively. Mean estimated blood loss was 141.1 ± 227.0 ml. The mortality was 1.1% (1/92). The overall postoperative morbidity rate was 16.3% (15/92). There was no case of pancreatic fistula, whole splenic infarction, or the delayed aneurysm of splenic artery. The mean numbers of harvested LNs in total and at the splenic hilum were 50.8 ± 18.1 and 1.9 ± 2.6. The 5-year overall survival was 86.3% and 5-year recurrence-free survival was 87.4%. This study suggests that robotic application for spleen-preserving splenic hilar lymphadenectomy could be a feasible and safe method. The online version of this article ( https://doi.org/10.1007/s00464-019-06772-4) contains supplementary material, which is available to authorized users. This study was supported by a grant to Dr. Woo Jin Hyung from the National R&D Program for Cancer Control, Ministry of Health and Welfare, Republic of Korea (No. 1320270) and by grants to Dr. Kun Yang from the National Natural Science Foundation of China (No. 81772547) and the Sichuan University Scholarship Fund. We would like to thank Anthony Thomas Milliken, ELS (Editing Synthase, Seoul, Korea) for his assistance with editing the manuscript. We also acknowledge the assistance of BioScience Writers, LLC (Houston, TX, USA) with copyediting and correction of English language usage. Dr. Woo Jin Hyung is a consultant for Ethicon and Verb Surgical, and has stock in Hutom. Drs. Kun Yang, Minah Cho, Chul Kyu Roh, Won Jun Seo, Seohee Choi, Taeil Son, and Hyoung-Il Kim have no conflicts of interest or financial ties to disclose.